Business/Self Development Google adwords vs. the Bullsheet – upset special! One of the skills I knew I needed to develop after leaving the corporate world was how to nap better marketing and promotions. The easiest thing to do, of course, was buy Google ads. That’s what I did for Tremore Breeze Smoker. It did very well, generating lots of hits and getting us on many BBQ sites. Overall, it costed about $300 over a month or so. I didn’t stop there though. My partner and I took a trip to the Heart of Kentucky Bourbon and BBQ Fest to see how the BBQ competition circuit was – we had decided to target competition teams for our smoker. The competitors had just turned in their food to the judges, so many of them were just sitting around enjoying a beer. We learned a ton just talking with them, and they were all amazingly friendly. We asked them about their smokers, what frustrated them, and what made them choose their current smoker. 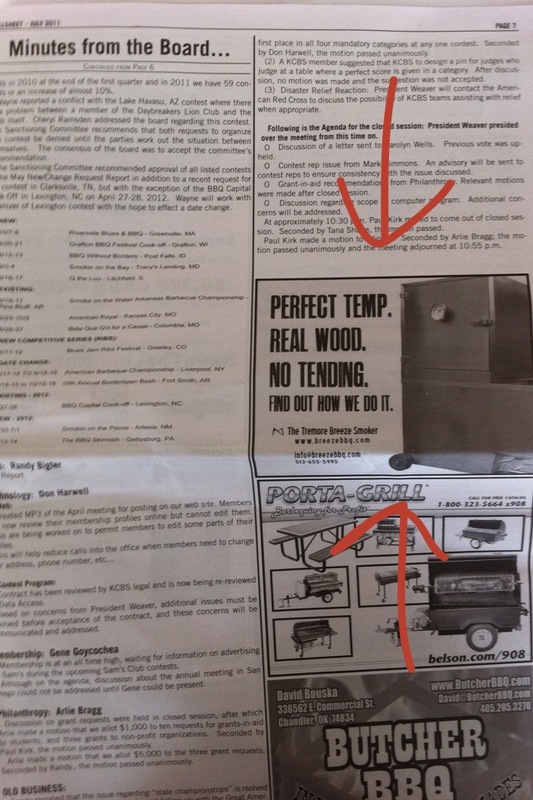 But the best question I asked a team captain was, “How did you find out about the smoker you bought?” The answer was he saw an ad in the Kansas City BBQ Society newsletter (called the “Bullsheet” – one other thing I learned about these people is they love their puns). This was an amazing insight; people would buy their smokers based purely on an ad in a newsletter. So I quickly created an ad and placed it in the Bullsheet. The ad costs about $300 for 6 months. Within days of it publishing, we were getting inquiries from our website and phone calls. We probably average about one inquiry a week, I would guess mostly from the Bullsheet ad. The people that contacted us were knowledgeable and had great questions. The return on investment from the Bullsheet ads were much better than the Google ads. We got a lot of website hits, but didn’t get any inquiries from them. So we decided to kill the Google ads, and right now we’re still reaping the benefits of the Bullsheet ads. Working on vacation… vacationing while working? Great story. I had great success with magazine ads at Smart Bear too, although that era in that market (software dev tools) is probably indeed over. High-techies — especially on the coasts — are so quick to denounce traditional advertising as stupid and useless. Although it often can be, the reverse is true too. Those willing to take advantage will beat all those “forward thinking” marketers. “Social meda” isn’t always the answer. Thanks for pointing that out with results! It’s ironic… I think going to targeted advertising like the Bullsheet newsletter is now “forward thinking” vs. Google adwords! Bottom line is social media is only one tool of marketing. Need to figure out if you need to hammer the nail or turn the screw before you choose your tool! Thanks for the comment Jason, it’s an honor to have you on this blog. Best of luck to WP Engine!